As I write this blog, my memoir book-proposal is out there in the world getting busy. I’m sorry, I can’t sell you. No one knows who you are. Storytelling (I just WON my first Story Slam at the LA Moth this Tuesday – after taking a storytelling class. HOORAY!). And last but certainly not least, NETWORKING, which includes: Going to RETREATS. So, to this end, I registered for a retreat headlined by best-selling powerhouse authors (and besties), Elizabeth Gilbert and Cheryl Strayed (Eat Pray Love and Wild, respectively). When I signed up, four other women from my online writers’ group (there are seven of us total) had also signed up. I had never before met any one of these women in person (we've been meeting for years via video conferencing). I arrive last Thursday after flying into San Jose’s airport, picking up my hybrid from Hertz and driving up the windy, narrow roads to 1440 Multiversity, which rests at the top of the Santa Cruz Mountains. I am so mesmerized by the scenery that I actually forget to be nervous about being in this unfamiliar situation (my first writer’s retreat, my first time meeting the other ladies face-to-face and first solo trip for any reason in over a decade). However, my stomach begins to churn the moment I take my place at the back of the 200 + person check in line. Only my stomach isn’t churning because of the length of the line, it is churning because I am the only Black person in it. Craning my neck to look as far down the line as possible, all I see are natural blond ponytails and top-buns, whose wearers look like they were born holding a yoga mat in one hand and a mason jar in the other. I do see a few silver-haired White women. I see three or four brown women (Middle Eastern, Indian or Pakistani?) and five Asian women (one I meet tells me that she is Korean American). I find out later that there are 11 men in attendance also. But there are no Black attendees. There are 600 people here in total. I’ve been the only one before. 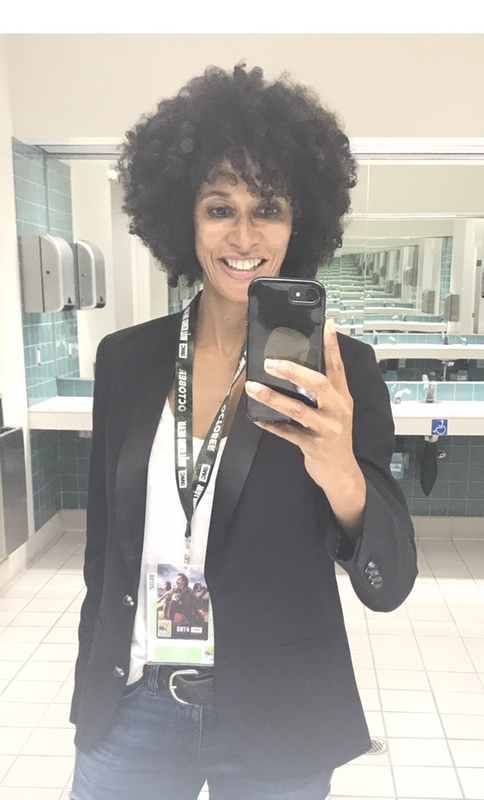 I was the only Black student in class many times when I was little, I was the only Black parent (many times) when my kids were little and I’m often the only Black person in my recovery meetings. But I didn’t know that this (my first-ever retreat) would be so massively big. And it hadn’t even vaguely occurred to me that out of 600 people, I could be the only Black one. Frankly, I am more than just shocked, I am actually deeply saddened. While I continue to stand in line, it begins to feel as though some of the women are now craning their necks to look back at me. Ignoring the stares, I try to picture how any of these yoga mat-carriers would feel if they’d arrived at a retreat where absolutely every one of the 600 attendees (and all of the facility staff-members) were Black. They’d probably slip away nervously and call someone, right? Or maybe they'd turn around and head back to the airport without saying a word to anyone. I feel irrational tears pressing against the backs of my eyes. Really?! How is it that an event this big, in twenty fricken eighteen can be so incredibly homogenous? How is that I can be the only one - STILL - AGAIN at age 54?! I think about getting back in my car and driving down that crazy mountain road back to the airport. I am pretty sure that no one would blame me if I did. Enter the women from my writers group. Gripping my car keys in my left hand so hard that my palm hurts, I use my right to send a group text, telling them that I’ve arrived and say that I’ll be “easy to spot." Moments later, Stephanie appears (she lives in Portland) and then Dana (who lives in Charlottesville). They are both so happy to see me that it relieves a bit of my self-consciousness. Soon we are in the dining hall. We’ve now been joined by Amy (she lives in Oakland) and Riva who lives in Toronto. These four women recognize immediately that I am the only Black participant here and know better than to pretend that it isn’t an issue. They discuss it openly and inquire without agenda how things feel for me. I am so at home with them in those first few moments that I almost get teary again. I guess I'll stay for the night at least. Day two of the retreat I think that I spot a Black person out of the corner of my eye on the other side of the auditorium — then that person is gone — disappeared. Hold up! Did I just imagine her? Later in the afternoon when I actually see her against a far wall, my suspicion is confirmed. Oh yes. Definitely a sister. We nod, acknowledging each other across the room (as is our code). I am relieved, but also in a very strange way, I am almost disappointed. You see, in just two days time, I have started to relax into my solo minority role (although I am still a bit unsure as how to receive the many women who continue to approach me with strong handshakes and teary eyes -- thanking me for being here). Huh?? You’re welcome, I guess. These encounters aside, I’ve discovered that even in the Whitest of White environments, with the help of these four women, I’ve been able (this time) to set aside my painful memories of being the only Black person and have a new experience with it. 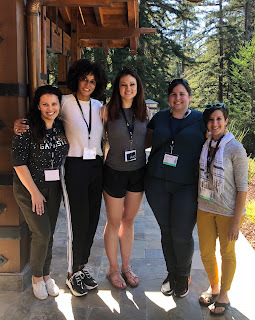 The truth is that I've having the time of my life at the Brave Magic retreat. Once again, I've learned something new about the most important person in my life — me. I was in a recovery meeting a few years ago and this pretty famous, two-time award –winning actress was sharing that she was struggling – not with booze, but with her recent fall out of the limelight (and the resulting “broke-ness” that followed). She was lamenting about having to rely on the kindness of her more prosperous actor friends while waiting for her agents to come up with some role worthy of her status. She said that she was sickened by the idea that she might have to take some “menial” job until the next great part came along. She said that she didn’t know if she was cut out to live like “other people” and then she burst into sobs. It was around this same time that a kid named Jordyn Owens joined my son’s, Miles and Justin’s basketball team. Besides Miles and Justin, Jordyn was the only other “mixed” kid on the court (and quite the phenomenal point guard). That, coupled with the fact that our boys really got along, made it natural for my ex husband and I to gravitate toward his parents, Geoffrey and Josette. Many are the time that I would climb past all the other parents on the bleachers (smiling polite “hellos” and “excuse mes”) to sit up next to the Owenses. They would do the same if we were there first. It was a nice, unspoken camaraderie, safe and easy. Josette is a pistol – fun loving and personable (with an enviable head of shining, dark brown hair). Geoffrey is mild-mannered, well spoken and kind -- rarely speaking though, while the ball was in play. He kept his eyes trained on his son the entire time and his rare outbursts were usually because of a bad call from the ref or a whoop for another coast-to-coast play by Jordyn. When Geoffrey wasn’t working (acting) both he and Josette were at every practice and game. I was always struck by Geoffrey’s fierce devotion to his family and by their devotion to each other. I was sad when they moved back east in 2010. I’ll stop here and say that for those of you who may have been consumed this week with the fervor surrounding the Supreme Court Justice confirmation hearings, the anonymous New York Times op-ed or the Nike/Kaepernick ad campaign, there is another great little story going around that also deserves your attention. It’s about the job shaming of a former Cosby Show actor. Have you seen it? Mr. Owens was photographed at his former job (Trader Joes) where he bagged groceries for 15 months. Fox News posted it in an apparent effort to shame him, but this wonderful thing happened instead. 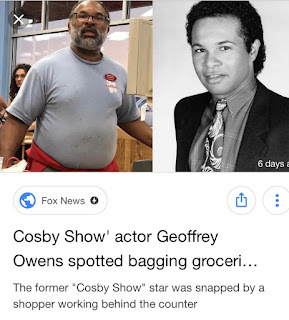 Quite without meaning to, by posting that photo of Geoffrey at work, Fox News launched an honest to goodness, “trending” hashtag hero -- #realman #geoffreyowens #actorswithdayjobs #hero. When I saw Geoffrey‘s interview on Good Morning America this Tuesday, I was struck again, not just by his devotion to his family, but also by his humility. 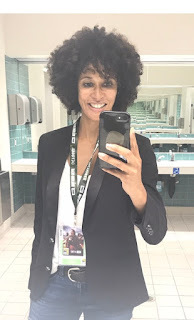 It is rare, I think to see anyone in his chosen profession exhibiting that kind of “Zen energy” when his or her identity has been called into question. I was so proud when I watched how he fielded the questions, handled the attention. I think I felt like I had something to do with it because I have a personal connection with him and his family ("Hey, hey! I know that guy! Our kids used to play basketball together!"). It also struck me after watching his segment, how very wrong that famous actress had actually been (obvi). There was no honor in her living off of her more fortunate friends. There was no dignity in refusing honest work while she waited for the right part. And there was no humility in voicing her cowardice about the possibility of having to "live like other people." I just really love that Geoffrey didn’t even know he was trending on Twitter until Robin Roberts told him. I adore the fact that he was genuinely surprised to find out that Tyler Perry had been watching him trend and offered him a role in his new OWN series. An offer, which Geoffrey has apparently, now accepted (he'll appear in 10 episodes!). That actress by the way, was also in the news again recently (though not for the same reasons as our Mr. Owens, unfortunately). She is apparently facing some petty burglary charges -- a burglary which took place just a few miles away from where Geoffrey did his first, exclusive interview this past Tuesday. Her item was minor news for a day or two (while Geoffrey is still a trending topic on Twitter as I write this). Side note - apparently rapper, Nicki Minaj, was also so inspired by his hashtag story that she announced her intentions (yesterday) to "donate" $25K to him. Honor verses ego, dignity verses degradation, humility verses humiliation. 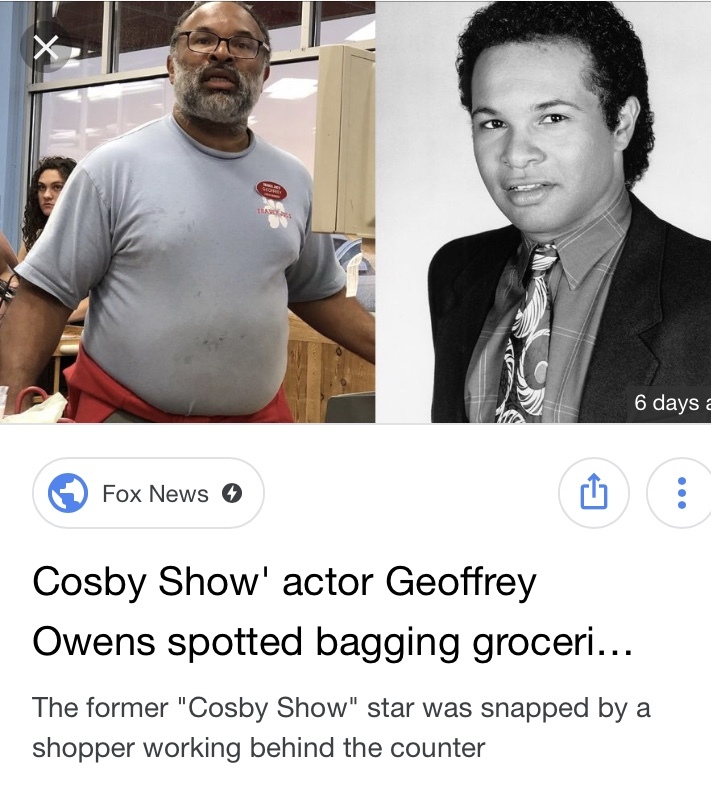 So thanks Fox News, for not only highlighting the fact that there are still men and women who are making all the right choices -- but that Geoffrey Owens is one of them.